World War I has been noted for the amount of incredibly evocative war poetry it produced, notably from such soldier-poets as Wilfred Owen and Siegfried Sassoon. However, very few of those well-known poets were American. Joyce Kilmer, who went to war with the New York National Guard’s famed 165th Infantry Regiment, the “Fighting 69th,” was a renowned American poet before he was killed at the Second Battle of the Marne in 1918. The 103d Infantry arrived in France with the 26th Division in October 1917 and began training under French instructors near the town of Neufchateau, where the New England doughboys endured a harsh winter. (Maine National Guard Archives) Alan Seeger, uncle of American folk singer Pete Seeger, penned the poem, “I Have a Rendezvous with Death,” which was published posthumously after he was killed in action in 1916 while serving with the French Foreign Legion. The poem was apparently a favorite of President John F. Kennedy. Overall, the number of war poets produced by the American Expeditionary Forces (AEF) was small, perhaps because the United States did not enter World War I until 1917. 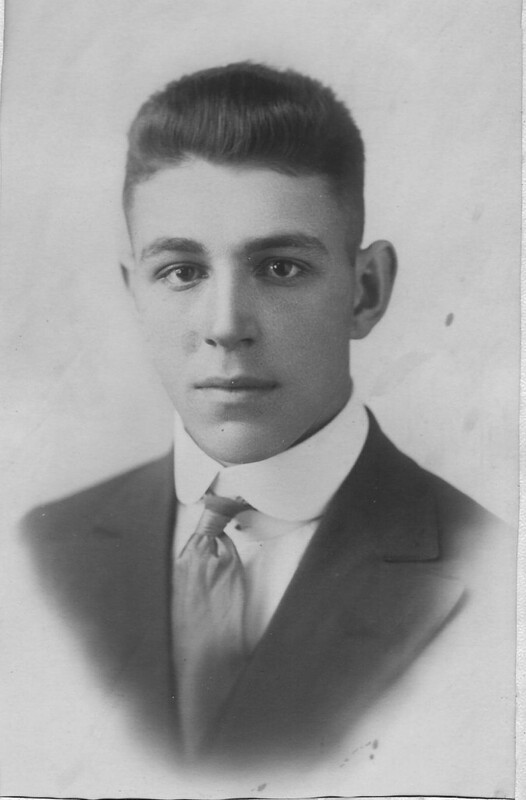 That, however, did not stop Corporal Ralph T. Moan from picking up the pen when he returned home to Maine in 1919. On 9 October 1917, Private Moan and the rest of the 103rd Infantry arrived in Liverpool, England. From there they entrained for Southampton, where they went into rest barracks. At this time, thousands of doughboys were flooding into England to become part of the massive Allied war machine. This was a new and fascinating experience for the boys from rural Maine, most of whom had never left their own state, let alone country. Moan and his buddy Foster Tuell went exploring, expressing great fascination with British money and British women. Their efforts to “see what the English girls were like” ended in disappointment after the objects of their affections stood them up. Undaunted, the young men—Moan was but twenty years old—continued to explore their environs until 16 October, when they boarded a ship to Le Havre, France. When they arrived at Le Havre, the 26th Division became the first full American division to arrive in France, as well as the first National Guard division. From Le Havre, the 103d Infantry moved into winter quarters around the town of Neufchateau. There, the young men endured a harsh winter where they often had to pawn their belongings to buy food and, as some of the first Americans there, had to construct their own barracks, all while undergoing a rigorous training regimen from French instructors. Moan’s own diary from this time period expresses his own youthful optimism, being more concerned in finding “a good feed,” dancing (he writes with great frustration over being denied dances with Red Cross women because that was the purview of officers), or singing with his friends than in the goings-on of the war. In January, he was assigned the position of mechanic in the company, responsible for maintaining trucks, weapons, and equipment. The promotion came with a pay increase, but it also meant that during combat he would serve as a litter-bearer or runner. At the urging of their division commander, Major General Clarence Edwards, the 26th Division was sent to the front ahead of schedule. In a series of foot marches and rail trips, the division arrived on the Chemin Des Dames Front near the French city of Soissons in early February 1918. Moan wrote of seeing the ruins of the towns and scavenging for war artifacts. In successive marches, the 103d Infantry moved closer to the front lines, witnessing the effects of the war firsthand. However, Moan’s war seemed mild and carefree in the early months of 1918, as he and his friend Tuell sat outside in the French sunshine watching Allied and German airplanes dogfight in the clouds. Most men had never seen an airplane before and were continuously amazed to watch the biplanes that darted through the air. Since the men were so new to war, they did not yet know enough to get under cover when they heard an aircraft overhead, but would instead rush outside to get a look. At night they watched the long searchlight beams pick out German aircraft and then remarked in amazement at the streams of antiaircraft fire that were sent skyward. 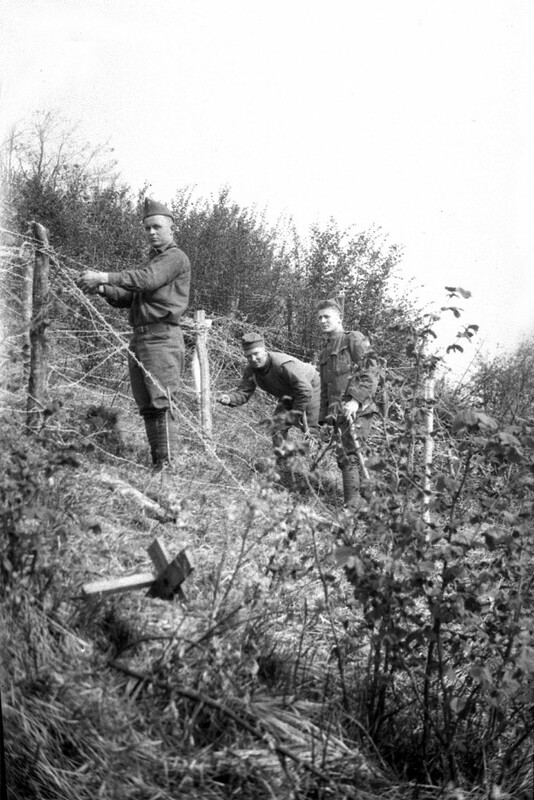 This was a quiet sector of the front, and the 26th Division was still learning the tactics of trench warfare under the tutelage of their French teachers. 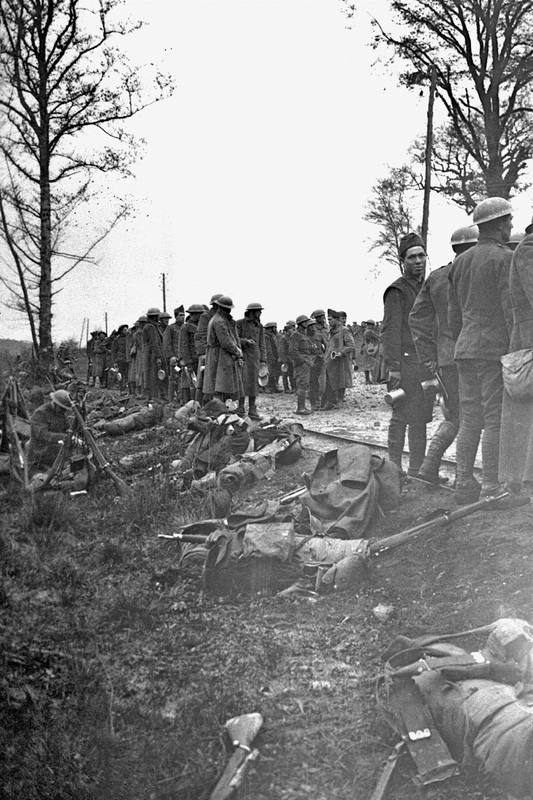 As part of this period of instruction at the Chemin des Dames, platoons, companies, and then battalions were all rotated to the front lines. At the time, infantry regiments were composed of three battalions of four companies each. The AEF adopted the model of their hosts, with one battalion on the front lines, one in support a mile back, and the last battalion in reserve. This allowed for a defense in depth. The 103d Infantry held forward positions along a canal, with their support troops billeted in old limestone quarries out of sight of searching enemy aircraft. The French and Germans had held an informal truce had held on the Chemin des Dames before the Americans had arrived. Both sides were severely worn from fighting and this sector was a place where battle-scarred units could come to rest and regroup. The Yankees changed that, firing at anything that moved and “turning no-man’s land into Yankee land,” as one division history noted. One sniper in the 103d Infantry was averaging one German a day. For the men in the support and reserve positions, the war was only seen when enemy aircraft flew over, or when the rare shell whistled in and exploded in a flurry of dirt. On 15 February, the regiment took its first battle casualty when Private Ralph Spaulding of Madison, Maine, was killed by an enemy shell. Private Moan, in support near the limestone quarries, noted that shelling intensified when their work parties got closer to the front lines. The ground that they held had been the scene of fierce fighting the year before, and blasted trees, bombed out houses, and the detritus of war met the men’s eyes wherever they looked. In all of this, Moan and his fellows maintained an optimistic outlook as only young men can. Everything changed for Moan and his fellow soldiers in March. 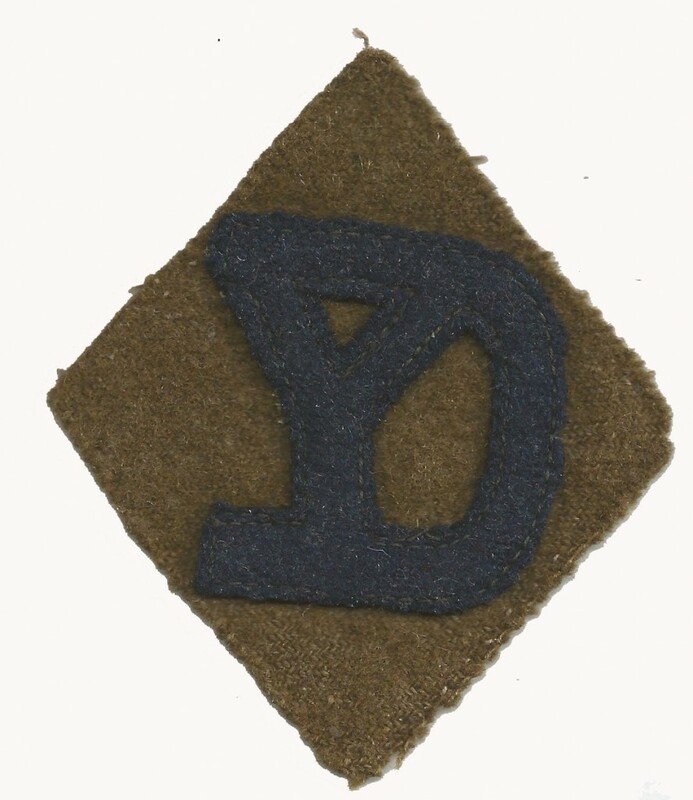 On 6 March, the 3d Battalion, 103rd Infantry, of which Moan’s Company K was a part, took over responsibility for the first line of trenches, directly opposite the German lines. Moan moved into a dugout, a small dwelling containing a light one-pounder gun and covered with logs for protection against enemy fire. It was here that Moan’s carefree attitude vanished. The morning arriving at the front, Moan was rudely awakened from sleep when a German shell struck his dugout during an artillery barrage. He wrote that he could count at least seventy shells striking per minute, stating, “The man who said he was not scared is a liar.” The Germans hit the Yankee lines with a mixture of high explosive and poison gas shells. Massive explosions rocked the 103d Infantry’s positions for two days as the men huddled down in the trenches wearing their gas masks. Over the next few days, Moan hauled casualties over barbed wire entanglements and through muddy sloughs. His job as a litter-bearer meant recovering casualties under fire and then hauling them back to the battalion aid stations, sometimes more than a mile. One might think that after this damning indictment of combat, Ralph T. Moan might have vanished from the history books. In reality, it was just the beginning. On 5 July, the 103d Infantry Regiment entered the blood-soaked boughs of Belleau Wood to relieve the exhausted U.S. marines and soldiers of the 2d Division. Enduring nearly two weeks of enemy artillery fire, gas, and probing attacks, the 26th Division finally struck back in the opening moves of the Aisne-Marne offensive. Company K, with the rest of 3d Battalion, went over the top for the first time in the early morning hours of 18 July, seizing the small village of Torcy. 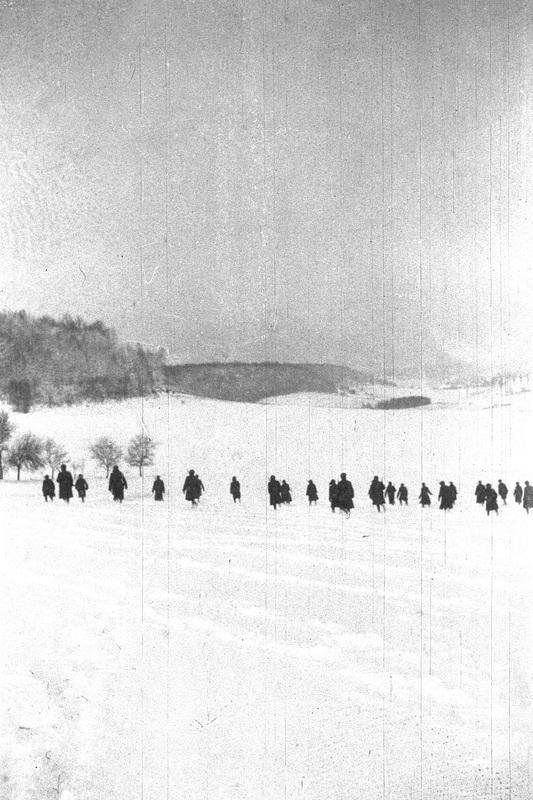 In a week of severe combat, the 26th Division advanced fifteen kilometers before being relieved by the 42d Division. After three weeks in a rest area, the 26th reentered the fray at St. Mihiel on 12 September. After the summer campaigns, the Allies began planning for the final operations to break the German lines and, potentially, bring an end of the war. This culminated with the Meuse-Argonne offensive, where, on the morning of 26 September 1918, thirty-seven French and U.S. divisions advanced against German positions along the Meuse Rover and in the Argonne Forest. To create a diversion from the main assault, two battalions of infantry from the 26th Division were detailed to make a raid on the towns of Riaville and Marcheville on the plain of the Woëvre River to tie down German forces and prevent them from reinforcing other positions along their lines. The 1st Battalion, 103d Infantry, was to move on Riaville, while 1st Battalion, 102d Infantry (Connecticut National Guard) would target Marcheville. Ralph Moan’s 3d Battalion was on outpost duty on the main line of the American-held trenches, overlooking the plain of the Woëvre. The 1st Battalion, 103d Infantry, advanced through the fog on the morning of 26 September against only light resistance until they entered the town of Riaville. Here, the Yankees encountered concrete machine-gun positions and snipers, supported by artillery. The doughboys entered the town, were pushed back, counter-attacked, and were pushed back again. German minenwerfer fire began to fall on the beleaguered American infantry and casualties rose. 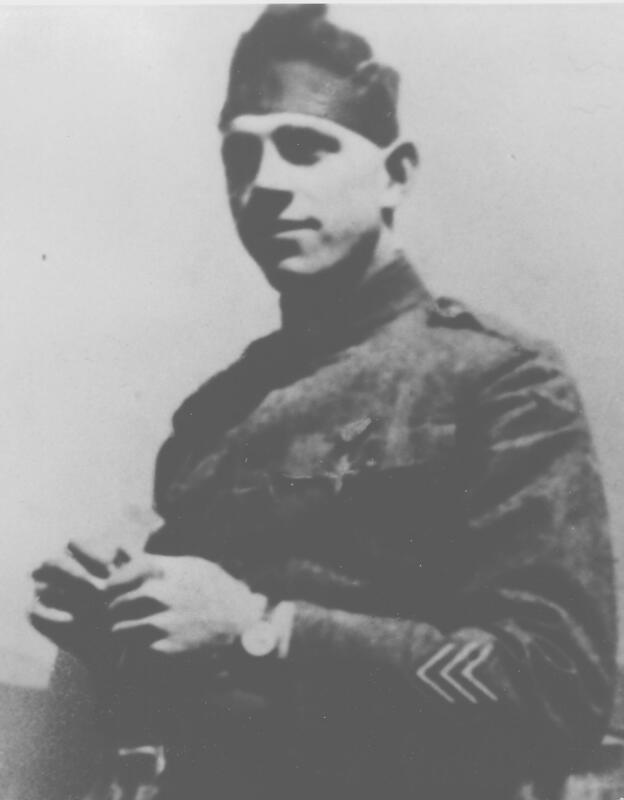 Major James W. Hanson, commanding the battalion, sent back reports that his liaison with his own supporting artillery was failing and that he could not get sustained artillery fire on German positions. During the Meuse-Argonne campaign, Moan served as a runner. This was an important duty, as the first thing the enemy targeted during a firefight was the lines of communication, such as field telephone lines. The Riaville Raid was no different. 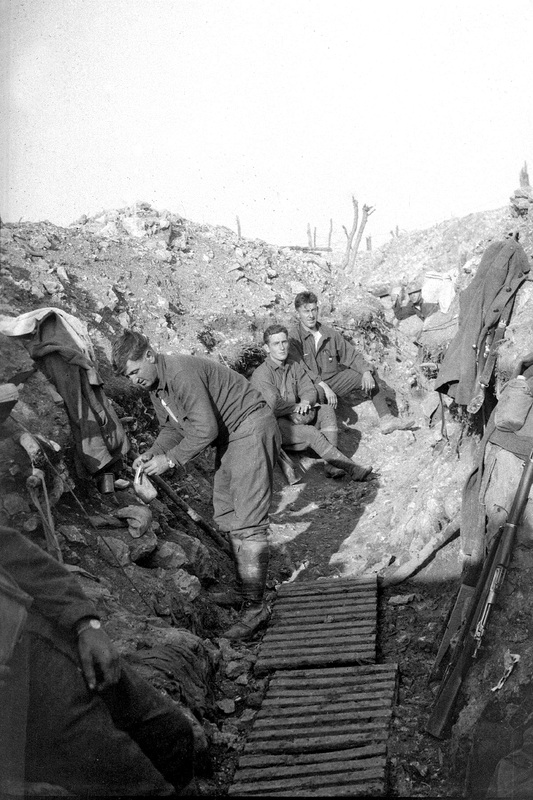 The wires for field telephones were cut almost immediately by artillery fire and runners were taking heavy casualties as they braved the shell-riddled open plains back to the American lines. The smoke and heavy fog that lingered over the town made artillery observation difficult, so Moan had to make several trips back and forth between the lines, a distance of 250-300 yards, to relay messages to the supporting batteries. His third trip was necessitated by friendly artillery firing short, their rounds impacting in front of the town where 1st Battalion was hunkered down in an attempt to gain a foothold. Moan took off once again, trying to avoid the German artillery barrage and timing his run to follow it down the field. His luck, however, ran out and he was tossed twenty feet by an exploding shell. He awoke later in a hospital, after the raid was over; concussed but alive. The plucky doughboys of the 103d Infantry had fought it out in Riaville all day. During the course f the day’s fighting, the town exchanging hands several times. Once darkness fell, they withdrew, accomplishing their mission of a diversionary raid, at the cost of ten killed and fifty-three wounded. audiences all across the country. Oddly enough, Moan’s path would lead back to the U.S. military. When he and his second wife, Kathreen, ended up working at Fort Huachuca, Arizona, in 1957, she as an Army artist and he as an Air Force administrator. 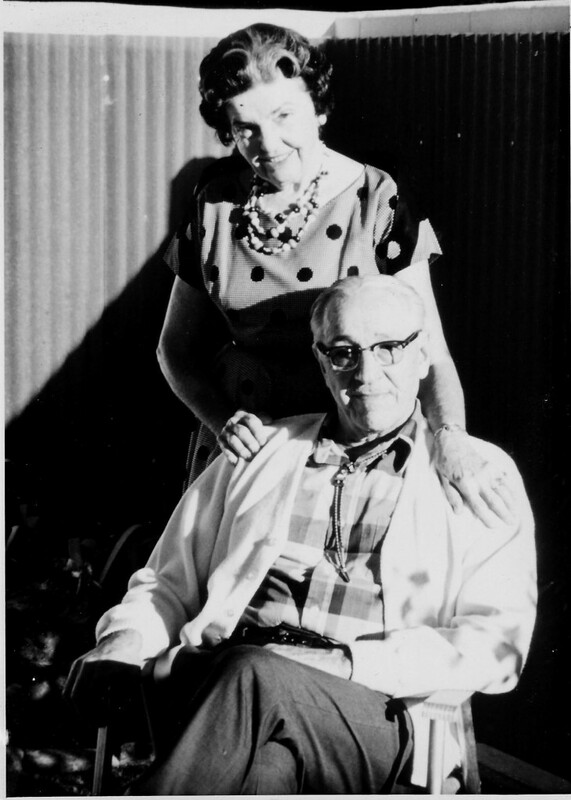 Ralph’s creative process did not end with singing; he won first place in an Armed Forces Writers League short story contest and was a member of the Tucson branch of the Arizona State Poetry Society. In fact, he seems to have pushed his war memories far behind him, never speaking about them with his children or grandchildren. He was a lifelong member of the Veterans of Foreign Wars, the Disabled American Veterans, and the Freemasons. Die in the stinking mud. Darting from shell hole to shell hole. I was numb with fear. But this time a barrage was on. Yes, it must be done, but how? Dug in with all I had. My head—torn from my body! Peace, quiet, clean white sheets? I’m still alive, I did not die. Presented in stark and vivid detail, Moan captured the essence of the brutality of war as clearly as Owen or Sassoon. In his poetry, we can see the emotional scars that he carried with him forever as a veteran of some of the most horrific fighting of the twentieth century. Like so many combat veterans, Moan found solace in putting pen to paper and writing. These few lines of verse must surely place Ralph Moan of East Machias, Maine, as one of the soldier-poets of World War I.